Until now, Open Channel’s benefits were made available through mobile operators and smartphone manufacturers. They certainly benefit enormously from the traffic and battery optimization, but we always thought we can do better, and one day bring Open Channel available for everyone. We wanted to bring a unique set of features that benefit you personally, as an end user. And we didn’t stop in extending the battery life. Open Channel helps you control your data usage, stands between you and the companies attempting to track your privacy, and tracks the quality of your online experience for you. We hope you will find these useful! Many apps use the network and drain battery in the background. As you use your phone, we show how much they affect your battery life and how much Open Channel extends it for you. 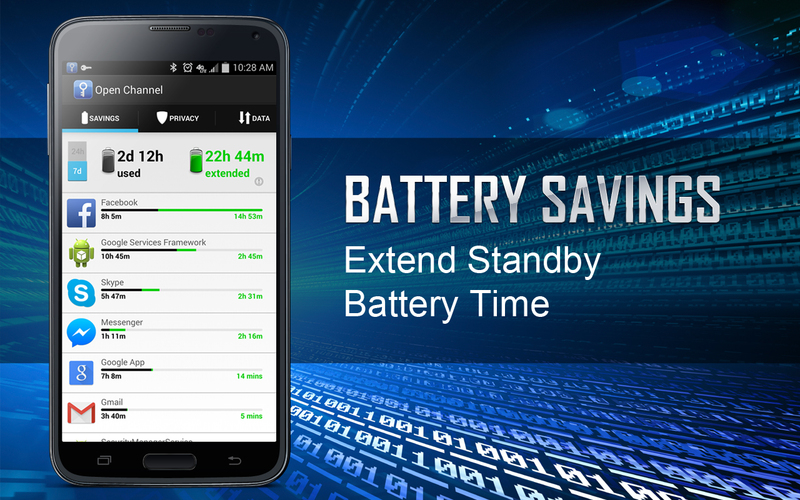 Open Channel’s smart algorithms work in the background to increase standby battery life. Open Channel provides unique views and controls to your data usage for each application and type of data, including videos and images. Open Channel helps you understand how you use mobile data and control the usage. Use the “Set Data Plan” feature to track your data usage and the “Set Limits” feature to avoid overage charges. Many companies track your activity online without your consent. Open Channel can block these trackers to protect your privacy. Open Channel monitors the quality of your online experience and reports it back to you on a map to highlight where your experience is good and where it is not. As we gather data from more users, you will be able to compare your experience to others. Open Channel is now available for Android smartphones from Google Play, free of charge. This entry was posted in Longer Battery Life, SEVEN News, Smartphone battery life and tagged Android, Google Play, Mobile Applications. Bookmark the permalink.